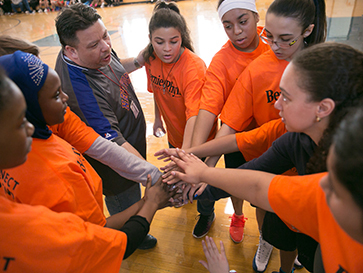 Unity Weekend brings together young people from across BGCB’s Clubs for this special event to learn teamwork, make personal connections that reach beyond their neighborhood stereotypes, and of course play basketball! YouthConnect social workers and BGCB staff ensure that the experience is both meaningful and fun. Past special guests have included Celtics players, coaches, and staff, as well as Boston Police Department officers. To date, Unity Weekend has raised over a million dollars to support YouthConnect’s general operating budget. More than 85% of YouthConnect’s funding directly supports the social workers who are working with youth each and every day. Thank you to this year’s sponsors for making the event possible: WHDH – 7 News Boston, Bernie & Phyl’s Furniture, Boston Celtic’s Shamrock Foundation, Choate, Hall & Stewart LLP, and Converse.